The EventStream Client SDK implements the EventStream command protocol that is needed to access the EventStream service of MOBOTIX cameras from a C++ application. This service provides access to live AV streams as well as to recordings stored on the camera. In addition, the EventStream service includes a notification mechanism that allows the camera to send event notifications to the client. The entire communication is handled through a single TCP connection. The platform specific packages include the required library and header files and some sample C++ code together with a documentation of the usage. 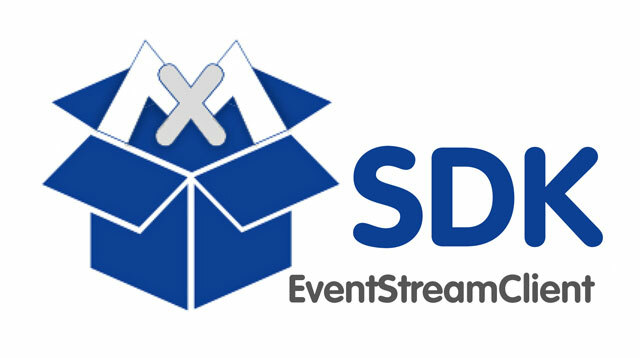 This is the initial release of EventStream Client SDK for Linux (x86_64), OS X (x86_64) and Windows (x86_32/64). Here you find a short description of the SDK's features and its usage. Further information is included in the file 'doc/ReadMe.txt' which is contained in the platform specific packages. The MOBOTIX MxMessageSystem allows actions and alarm notifications to be sent and received throughout the entire network. The MOBOTIX MxMessageSystem SDK helps system integrators and software developers to integrate the MxMessageSystem into their own C++ applications as well as to send and receive messages. Second release of MxMessageSystem SDK for Linux (Ubuntu 16.4, x86_64), OS X (x86_64) and now additionally Windows (x86_32). Supports sending and receiving of MxMessages. Further information are included in the ReadMe.html which is included in the zip file. Note: You can download the entire current SDK 1.0.2 package here. and they will be discussed more thoroughly in the following sections. The intended audience for the Software Development Kit are system integrators and developers with a background in image compression. In order to reasonably make use of the included source code, solid experience with C++ development is required. Please note that MOBOTIX AG's regular product support does not include assistance in programming with the SDK's C++ library. However, feel free to contact mxpeg-sdk@mobotix.com if you have questions of this sort or regarding MxPEG in general. The sole purpose of this release is to publish an updated version of the MOBOTIX MxPEG ActiveX Component. First off, there's been a change in functional scope. The package no longer contains any user interface and/or video display elements, but concentrates on the actual MxPEG decoding instead. Thus, the dependency on Qt has been eliminated. As another consequence the portable MxPEG Player application is no longer part of MxPEG SDK. Audio Support : The decoder interfaces have been extended in order to also hand decoded audio data over to the client application code for further processing. Note however that in order to actually hear anything, you will have to provide your own audio output routines for your specific target platform - a fact that is now also true for displaying video. As was requested by many customers, the package now also compiles under Microsoft Visual C++. At MX, we're working and testing with Visual Studio 2005. We are currently migrating considerable parts of our codebase to a component oriented design, with the MxPEG SDK C++ package actually being a subset of it. As a result, the MxPEG SDK code has also been reworked and molded into components, and its infrastructure and interfaces have received a fair amount of streamlining in the process. The actual MxPEG decoder engine has grown more mature: it implements a larger subset of the JPEG stream specification including an additional subsampling mode (enabling it to also properly digest MJPEG streams coming in from certain Axis and MerritLiLin camera models), hands more frame parameters over to the client application and has an improved handling of error conditions. HTTP API documentation, reproduced from the camera's online help. Image retrieval / streaming CGI documentation, reproduced from the camera's online help. Remote configuration CGI documentation, reproduced from the camera's online help. Please note that these API pages are not generic, but depend on the camera model and software version. It is thus highly recommended to open the HTTP API and CGI Parameters of the MOBOTIX Camera help topics on your camera to find the options that are available. The MxPEG ActiveX Component shipping with each MOBOTIX camera can be used as a plugin in Microsoft Internet Explorer, thus allowing for playback of live or stored MxPEG video streams in the web browser, including audio if desired. MJPEG streams can be displayed as well, but obviously without sound. As part of the Software Development Kit, MOBOTIX releases a C++ library in open source form under the BSD License. It provides MxPEG decoding to system integrators and runs on Windows, Linux and Mac OS X. System integrators are encouraged to incorporate the code in their own software products. Since the sources are freely available, potential shortcomings if they should be considered as such can be easily fixed, as missing features for a given specific application scenario can be added. By using the MxPEG SDK C++ library, application developers have the most flexible access to MxPEG or MJPEG video streams coming in from MOBOTIX cameras. In contrast to the ActiveX component described earlier, due to their platform-independent nature, these classes can be used to build applications that can be deployed on Windows, Linux or Mac OS X.
all together with the necessary timestamp information for proper resynchronization. Furthermore, entire frames can be dumped in raw RGB or YUV formats, as well as they can be re-packed into individual single JPEG frames. To complete the package, there is also an optional Qt-dependent part of the library that provides support for the aforementioned camera HTTP API by implementing classes for comfortably performing HTTP GET transactions with remote cameras. Please note again that assistance in programming with the SDK's C++ library is not included in MOBOTIX AG's regular product support. Note also that solid experience with C++ development is required to reasonably put to use the included source code. To help you better understand the aforementioned C++ library's source code, and to enable you to extend it in case you need access to a larger subset of the stream data, our Development Tools package is completed by a detailed description of the MxPEG stream format. Copyright © 2005-2007, MOBOTIX AG. All rights reserved.